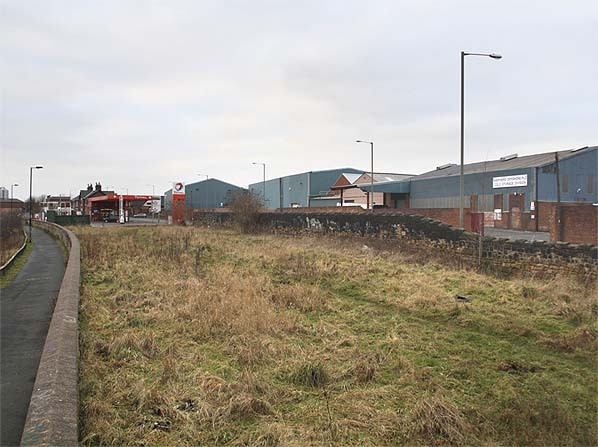 South side of Hadrian Road, close to junction with Park Road, about 300 yd east of Wallsend station. Demolished. A petrol station occupies the site. The base of the signal box survives as a store. Railway cottages are extant west of former level crossing. 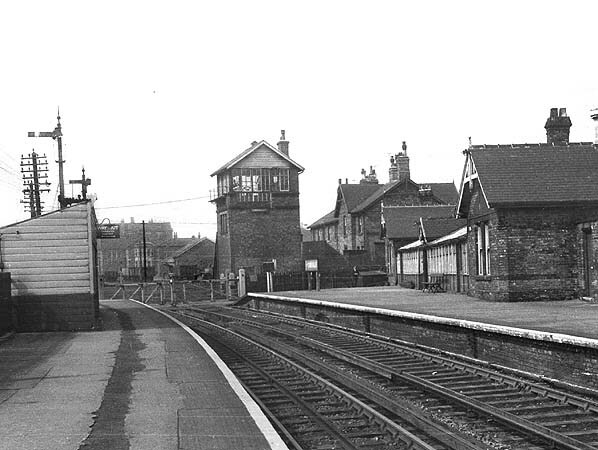 The brick-built, single-storey main building was at the west end of the down platform. The frontage was straight and had a large central gable over the entrance, with decorative woodwork under the gable and a finial above. The pitched roof-line of the cross-wings on the platform side ended in half-hipped gables on the frontage. At the east end of the building, looking like an afterthought, was a further section which reversed the roof details of the pavilions, with a half-hipped end facing the platform and a gable end on the frontage. platform, serving as a waiting room, a glazed verandah with a lean-to roof stretched between the cross-wings, and above its central entrance on the platform side was a small gable. The two cross-wing gables were decorated with simple wooden finials and pendants, which survived until closure. On the same side of the tracks beyond the level crossing was a tall brick-built NER signal box with a pitched roof, accompanied by a row of railway cottages. The up platform had a wooden waiting shelter towards its west end. A more ambitious main building design, with an arched portico, a small tower, and white glazed interior was intended for Carville station but was never built. 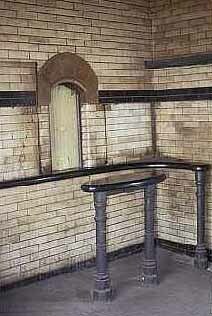 It was probably thought extravagant for such an industrial environment and for the expected clientele. Despite its proximity to Wallsend station, Carville was not starved of passengers. In the closing years of the branch, Carville was its busiest station, conveniently situated at the entrance to Wallsend Shipyard. When the siren announced the end of the afternoon shift, hundreds of men poured out of the premises, many of them onto the platforms at Carville; the station, silent during the day, was crowded for a few minutes. The main building survived until closure, though only the western end of the glazed verandah was intact. If they had the inclination, passengers could admire a display of potted plants on the south-facing waiting room window ledge. There were no buildings on the up platform at closure. 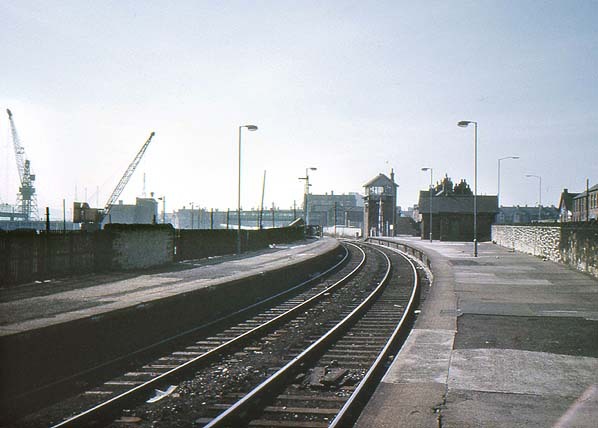 After Carville closed to passengers, a track remained in place until at least April 1987, terminating at Swan Hunter's Wallsend Shipyard. 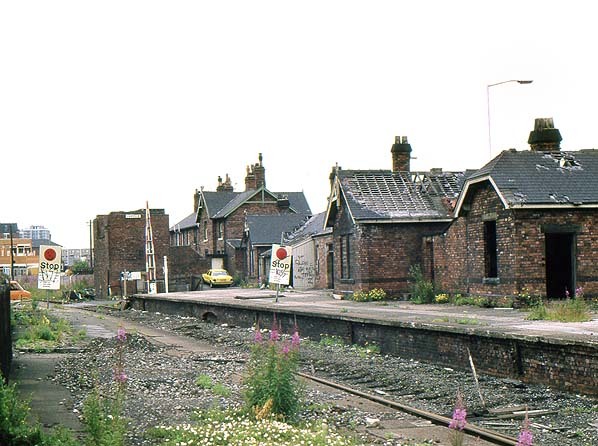 In 1979 the station was still largely intact. The 'British Railways Carville' enamel sign remained on the exterior wall, and the up platform nameboard had not been removed. Being wooden and faded to the point of illegibility it was not a collector's item! The lower half of the signal box was in place, still bearing its nameplate. Willington Quay was the last train on Riverside metals. Few people came to pay their last respects. A hand-chalked notice under the remains of the awning at Willington Quay announced the closure: 'No more waiting here after today'. Goods trains continued to use the line, but from 31 May 1978 Carville Swan Hunter Siding became the eastern terminus. By July 1979 rails from there to Percy Main had been removed. In April 1987 the line was further truncated to Shepherds Scrap Siding (St Peters). The last goods service ran on this section on 25 September 1987 and it was officially ‘taken out of use’ on 31 March 1988. 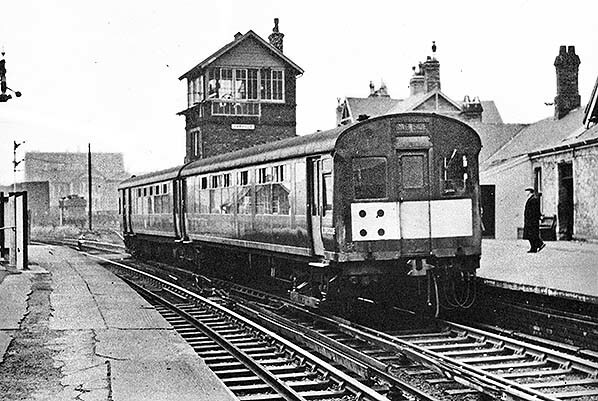 On 11 February 1967 at 12.15pm a single articulated 2-car electric multiple unit enters Carville station. The unit is forming the 12.00 noon Saturday-only departure from Newcastle via Riverside to West Monkseaton. These distinctive EMUs were operated on the North Tyneside lines from 1937, when introduced by the LNER, until they were gradually phased out by British Rail (Eastern Region) in 1966-67, giving way to diesel multiple units. 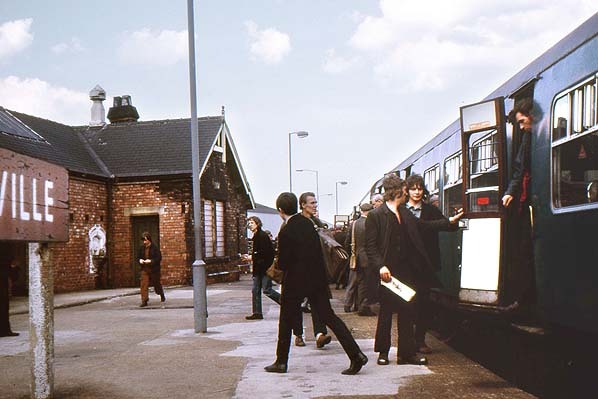 The last North Tyneside EMU ran on 17 June 1967. The view is looking west from the south (up) platform. 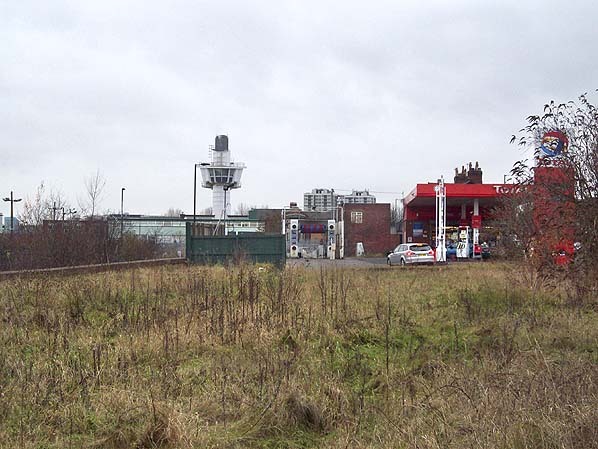 The site of Carville Station looking south west in December 2008. The base of the signalbox is still extant to the left of the car. in height is in line with the platform ramp.